The Maxwell winery building has a number of striking architectural features that stand the test of time: there’s the beautiful exposed limestone walls, for example, and sturdy Oregon pylons on the rear terrace that were recycled from the old Port Adelaide woolshed. “The ceiling [in the restaurant] is made from hemlock which came out from Latvia as ballast of a ship in 1900,” says winery general manager Jeremy Maxwell, son of owner and winemaker Mark. Many of those original features have not only been retained but highlighted by the recent remodelling and refurbishment of the winery’s restaurant and cellar door by architect Anatoly Patrick and interior designer Claire Kneebone, who have played up the fact that wine production at Maxwell occurs right next to the cellar door and have also introduced new “elements of theatre”. The most obvious structural change is that the previously open-air terrace at the front of the building was extended and fully enclosed to create a second all-weather dining space. The new terrace has an eye-catching ceiling made of Oregon timber battens, and a wall has been replaced by floor-to-ceiling windows overlooking the wine vats in the adjacent production area so diners can see the wine being made as they drink it. Jeremy says the new terrace, which is able to accommodate around 30 to 40 diners, extends the year-round capacity of the restaurant. That view takes in the vineyard, including the nearby old-vine Grenache and a maze and picnic area beyond, as well as surrounding countryside. A new lobby/foyer area has been created and bifold doors have been added to give a better flow between the enclosed terrace, tasting room and main restaurant dining area, while the former rustic terracotta tiled floors have been covered by oak floorboards to lighten up the spaces. In the main dining room, a “chef’s table” made from marble, limestone and bespoke tile finishes is the standout feature. It emphasises the luxurious feel of the space and is complemented by other new furniture (including Italian-made dining chairs), lighting and a large statement mirror which reflects the view from outside. Anatoly Patrick says part of the aim of the design was to create “a sense of awe and drama” as visitors move through the space. Maxwell is well-known for its mead, which Mark Maxwell’s father, Ken, started making in his backyard in the 1950s before releasing his first commercial mead in the 1960s. The hive was previously located at the back of the winery building, but is now behind glass in the foyer, with the bees entering and exiting via a tube through the roof. Maxwell Restaurant – under head chef Fabian Lehmann – has been recognised in a number of awards and publications, including the Australian Good Food Guide and the Australian Financial Review’s top 500 restaurant awards. Before the remodelling and refurbishment, it offered a single fine-dining menu. 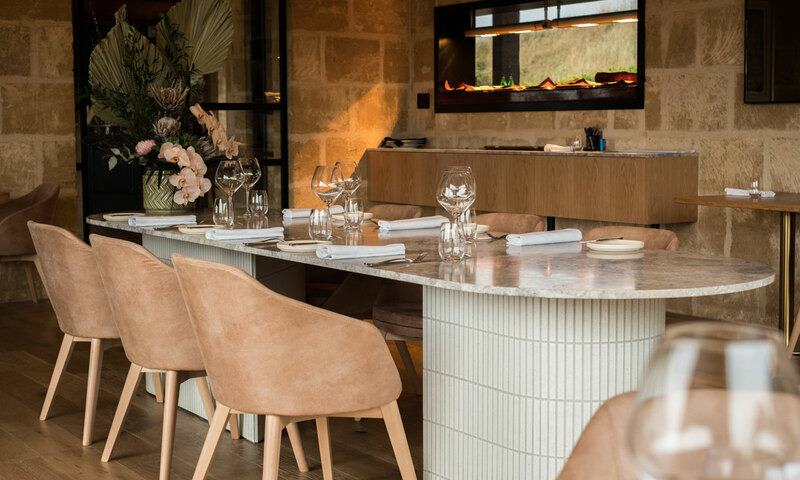 Now, Jeremy Maxwell says, the winery is “effectively offering two restaurants”, with diners given the option of a curated six-course or four-course “feed us” degustation in the main restaurant or a more casual “cellar-door menu”. The latter features a selection of entrée-size options, all priced under $26, which are designed for grazing and sharing and include the likes of kingfish sashimi with chimichurri, wild rice and finger lime, and kangaroo tartare with apple cucumber, horseradish and spring onion. The recent addition of new pastry chef Jason Brown, previously of Sydney’s nel. Restaurant, has also seen the restaurant enhance its dessert offering. One of his first tasks was to create a selection of canapes to complement a new mead flight. “The mead flight showcases four of our meads, and each is matched with a sweet canape. They’re quite decadent, really,” Jeremy says of the sweets, which include a quince and eucalyptus tart (served with honey mead) and a passionfruit and bee pollen bomb (with sparkling mead). Maxwell marketing manager Christian Burvill-Holmes says one of the big upsides of the refurbished spaces is that the winery can now offer a dining option for everyone who walks through the door. The tasting room has also been given a fresh look, including the addition of a stone bar installed at right angles to the main bar for sit-down tasting experiences. The full-height windows that have replaced what was previously a wall between the terrace and the winery have also given it a new outlook. “It’s a totally new dynamic,” says Burvill-Holmes. 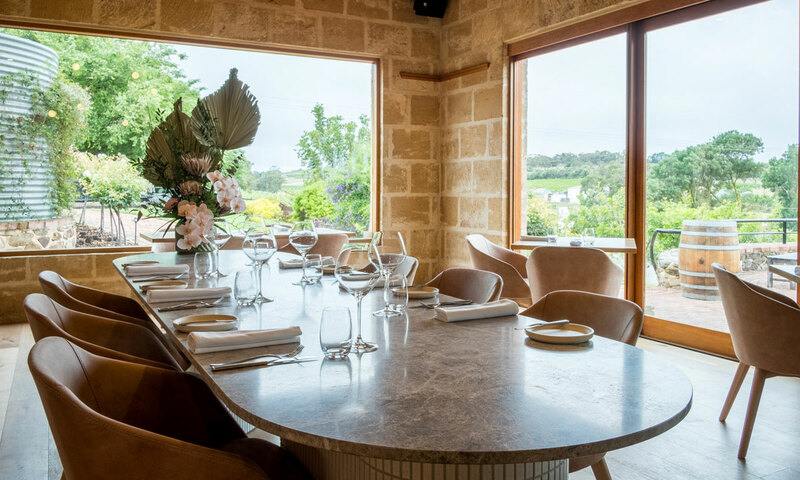 Maxwell, located at 19 Olivers Road in McLaren Vale, will host a Lime Cave Experience on April 12 and 13 as part of Tasting Australia, with chef Fabian Lehmann and his team creating a six-course menu to be paired with Maxwell wines and enjoyed in the winery’s lime cave.